With only limited exceptions, surface water law in Texas, like other western states, is based on a first-in-time, first-in-right principle. Basically, the first user of water from a stream or river has the senior priority to get water and, if there isn’t enough to go around, the users with the most junior priorities are out of luck. Even though most people would agree the true first user of water in Texas was the environment—fish and wildlife, including oysters, shrimp, Guadalupe bass, redfish, flounder, ducks, and whooping cranes—the environment doesn’t get a water right priority. For the most part, since the advent of the water rights system, the environment, along with the businesses that depend on healthy rivers and estuaries, has been getting by on whatever is left over from other users. Until fairly recently, being last in line wasn’t too damaging to Texas rivers and estuaries. Those natural systems are amazingly resilient and even as human water consumption increased, our fish and wildlife resources mostly persevered. There is a limit, however, and, as recent Texas droughts have illustrated, we are moving ever closer to the point where our ability to pass along a healthy natural heritage to future generations may be lost if we don’t take action now. On a positive note, Texas has a regionally-driven water planning process designed to estimate water demands fifty years into the future and to develop plans to meet those demands, as well as a legislatively created process to quantify environmental water needs. Unfortunately, the planning process has yet to incorporate environmental needs as a category of water use to be planned for. Even though surface water is owned by all Texans, the state issues perpetual permits, with a priority date and an authorized amount, authorizing withdrawal and use of water. The state has been doing that, in one form or another, since the late 1800s. In many areas, permits have been issued for more water than is expected to be in the river during dry times. Until about 1985, permits were issued without any consideration of the water needs for the environment. Since 1985, most new permits do include a requirement to leave a certain amount of water in the stream for the environment. Unfortunately, this practice is generally too little and too late, due to older rights (which account for most of the state’s surface water that is reliably available during droughts) having the first claim to water and because, even after 1985, permit conditions are often inadequately protective. There has been progress in addressing the problem. 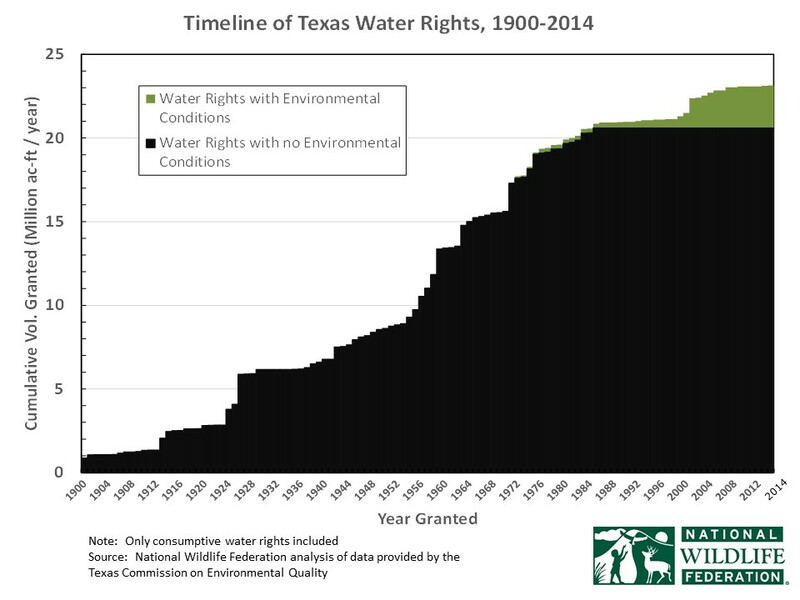 In 2007, the Texas Legislature passed Senate Bill 3 which includes a process for quantifying environmental water needs and for establishing environmental flow set-asides and permit standards governing new permits. Acknowledging the impact of those pre-1985 permits on environmental flows, the legislation also directed regional stakeholder committees to recommend various “strategies” – proactive measures to help meet environmental needs where those set-asides or permit standards (which only govern water not already allocated to a permit) are not adequate. Strategies can include measures like donation or purchase of existing rights to be converted to flow protection, dedication of wastewater return flows as the City of Houston agreed to do, and dry-year options, as implemented in the Edwards Aquifer Habitat Conservation Plan, to reduce irrigation diversions in drought periods. We’ve already seen examples of what can happen if flows fall too low. At the Aransas National Wildlife Refuge, 23 whooping cranes died during a drought in the winter of 2007-08. That led to litigation under the Endangered Species Act. Although that particular lawsuit ultimately was unsuccessful on specific legal grounds about who could be held accountable, the district court’s determination that water diversions reduced inflows resulting in the deaths of protected whooping cranes illustrates the uncertainty surrounding water management in the Guadalupe and San Antonio river basins, and eventually other basins, if environmental needs aren’t met. Farther down the coast, a once healthy commercial oyster fishery in Nueces Bay has been eliminated as a result of a combination of reduced freshwater inflows and mining of oyster shell from the bay. We’re running out of time. Nobody should think that meeting all water needs, especially environmental needs, is or will be easy. Best practices will require changed attitudes about water use (including for lawns and landscapes) as well as major advances in water use efficiency. Regardless, continuing to develop water plans based on the pretense that those environmental needs don’t exist, or don’t matter, is pure folly. A water plan that doesn’t account for all water needs is about as useful as a budget that doesn’t include rent or the house payment. It might look good on paper, but it’s not sustainable. And, actually managing our publicly owned waters like it’s okay to deprive rivers and estuaries of the fresh water needed to support healthy fish and wildlife populations is equally short-sighted. We have an obligation to pass on to future generations of Texans the opportunity to enjoy the same sort of recreational fishing in rivers and bays, tasty Texas seafood, and wildlife viewing, including whooping cranes, which this generation inherited. The Texas Living Waters Project is working to help protect Texas natural heritage by advocating for better environmental flow protection in permitting, more effective water conservation and drought contingency planning, affirmative strategies to meet environmental needs, and comprehensive water planning. Myron Hess manages Texas Water Programs and serves as legal counsel for the National Wildlife Federation in Austin. Those water programs include the Texas Living Waters Project, which is a partnership with the Lone Star Chapter of the Sierra Club and regional partner, the Galveston Bay Foundation. Before joining NWF in 1998, Myron was an attorney in private practice in Austin and Denver and at the Texas Parks and Wildlife Department. He has a law degree from the University of Texas and an undergraduate degree in Wildlife and Fisheries Sciences from Texas A&M University. He can be reached at hess@nwf.org.